As goes the Flint, so go the creatures who call it home… among them the shoal bass, one of the planet’s finest game fish. Georgia is not the only place you can catch shoal bass (Micropterus cataractae) in the world, but it is the best place and the most reliable place. Native to the Apalachicola-Chattahoochee-Flint (ACF) river system, shoalies—as they are affectionately known—have been severely depleted in the Chattahoochee side of the system due to habitat fragmentation from over a dozen dams up and down the river. The fish was introduced to Georgia’s Ocmulgee River several decades ago and has thrived there. 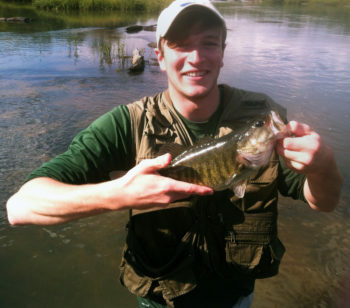 However, the Flint River remains the shoal bass’s center of abundance (on the planet!) 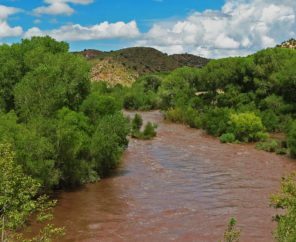 due to long, undammed reaches of river and due to the fact that throughout its length the Flint provides prime rocky shoal habitat: Class I, II, and III whitewater rapids in the upper Flint and vast limestone shoals in the lower Flint. Shoalies have excellent sporting qualities, hitting hard and fighting hard, with frequent jumps, readily taking artificial lures presented on casting and fly tackle. Fisherfolk who wade, kayak, use jon boats, and operate high-powered bass boats all target the species, and tournaments typically won with stringers of largemouth bass have seen the bacon taken home by a savvy shoal bass angler who ran far above flat reservoir water to target this lover of fast-running water. Georgia is home to the highest black bass biodiversity in North America primarily due to its many types of running water in over 70,000 miles of creeks, streams and rivers. Home to the world-record largemouth bass (Georgia’s state freshwater fish), the state draws anglers from all over the planet to the variety of fish offered by so many types of water. Shoal bass are very special among this pantheon of fine game fish. Now, Georgia Wildlife Federation and Flint Riverkeeper are supporting a bill in the Georgia General Assembly (House Bill 483) to declare the shoalie Georgia’s official native riverine sport fish, honoring the species itself and highlighting the importance of undammed, clean, flowing water to support the shoalie and Georgia’s fishing economy, heritage, and culture. The teamwork by American Rivers, Flint Riverkeeper and other partners to restore and protect habitat and healthy flows in the upper Flint River is critically important to maintaining a robust shoal bass fishery and the economic benefits it creates.